She was born in 1967 in Muğla. She graduated from Ege University Faculty of Medicine in 1990 and completed her speciality training in Faculty of Medicine, Department of Neurology at Istanbul University in 1999. Having resigned from her position at the German Hospital in 2004, she started her studies in the field of integrative medicine. Gökmen began to question diagnosis and the medication cycle relevant to diagnosis and engaged in probing the causes of disease by working specifically on some diseases especially headaches and migraines from which she suffered a lot throughout her life. Combining the conventional medical training with integrative medicine (neural therapy, acupuncture, homeopathy, magnetic field therapy) trainings she had received, she developed ‘Gökmen Approach’ algorithm for treatment. ‘Gökmen Approach’ detects the causes of some diseases as migraine and headaches in particular and also waist- neck pain and hernia, dizziness, tinnitus, fibromyalgia, restless leg syndrome and provides the rehabilitation of these causes by using the combined methods of conventional medicine (classic medicine) and integrative medicine. Specialized in the approach she developed in detecting the causes of diseases, Dr Gökmen’s different and new approach provided solution for pain in many patients. Gökmen claimed that cluster headaches originated only from the problems in teeth-jaw complex and she confirmed her assertion by relieving the pain through resolving the problem in teeth-jaw complex. Gökmen has one child and has taken on the task of working aimed at easing pain as a lifetime duty. As a consequence of her ten-year detailed and rigorous works on detecting and solving the causes of pain, Dr. Emel Gökmen constituted a method which she termed ‘Gökmen Approach’. The results obtained from the ten-year research, work and treatment process of 5000 patients with migraine and headaches, clinically showed the success of this method. She defined the algorithm which includes detecting the causes of migraine and headaches and solving them, as ‘Gökmen Approach in the Treatment of Migraine and Headaches’. How Has Gökmen Approach Been Formed? Neural Therapy Approach starts the first phase of the treatment algorithm. Having determined that all migraine symptoms were related to autonomic nervous system dysfunction (work disruption), Gökmen abandoned the opinion of migraine being ‘a brain disease’. Based on ‘interference fields sending negative stimulations to autonomic nervous system’ definition of neural therapy approach, she reached the conclusion that migraine was totally a disease of interference field. Within this period, as for migraine is an autonomic dysfunction, the idea that all migraineurs can be cured by neural therapy arose. Gökmen analysed the patient’s complaints and features of pain very well and made the chart of disease and duration of disease in neural therapy approach. She applied neural therapy on the interference fields she detected this way. Despite the positive results obtained in the treatment process,the approach could not be verified in some patients. As a result, Gökmen experienced the fact that injections applied in neural therapy were not enough to treat all the areas in interference fields. She saw that interference fields located in teeth-jaw complex can only be treated by working with dentists. Patients were referred to dentists at certain stages of treatment but the results of some treatments were not satisfactory. Thus,with the foresight that the big part of interference fields might be caused by inadequacy of dental treatment, the necessity to work with a specialist arose. After working with the specialists, Gökmen saw the necessity to manage the treatment. In the final stage, in order to manage the treatment, it was necessary to have enough level of dentistry. Gökmen created certain categories of interference fields with the results obtained from 5000 patients she had treated. For migraine, considering features of pain, patients’ age and age of onset, she detected the migraine groups and interference fields for these groups. For cluster headaches and trigeminal neuralgia, she concluded that these two diseases completely originated from teeth-jaw complex. Gökmen Approach is a treatment algorithm which reveals the causes of headaches and migraine by evaluating with an approach different from the currently accepted approach and solves these causes with non-traditional methods. 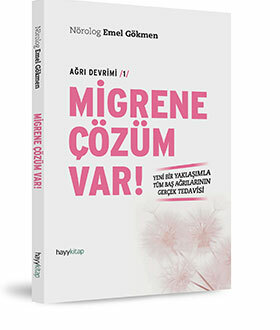 Gökmen Approach claims that “Migraine is a disease of interference field” by revealing migraine and headaches originate from interference fields in the body with clinical results. It is against the idea of last century that ‘Migraine is a brain disease’. Seeing that migraine is caused by the autonomic nervous system dysfunction, it detects the reasons creating this dysfunction. Revealing the causes of each headache (primary headaches) with unknown cause in IHS (International Headache Society) classification, it reclassifies them according to their causes. It reveals that cluster headaches and trigeminal neuralgia are aches completely originated from teeth-jaw complex. It claims that for both diseases, the problems in teeth-jaw complex can be solved only by working with dentists who are specialists in their fields. It indicates that the cause of continuation of some patients’ complaints despite receiving treatment is the lack of specialization. How is the treatment with Gökmen Approach? In the first stage, the interference fields of the patient is detected.Treatments of neural therapy and tooth-jaw complex are used to treat interference fields. These treatments are carried out with a team. The doctor managing the treatment (neurologist, pain specialist or family doctor) should have knowledge in interference field approach and teeth-jaw complex. The other doctors of the team should consist of specialists in their fields (endodontist, restorative treatment specialist, periodontologist, gnathology and prosthetic specialists, maxillofacial surgery specialist). In order to apply Gökmen Approach, aforementioned doctors(neurologist, pain specialists, family doctors and even dentists)should receive basic training. Following the basic training, this approach can be applied in the treatment of migraine and headache. With increasing experience in time, the success of treatment also increases.